Great day. Arrived Friday night after a speedy day for the sailors, and a 'boisterous' one for the rowers. The traditional Friday night revelry was a spit roast and entertainment from Elly and her band. Jetty House and the woofers was exemplary. Southport community put on a great cafe. Tents adorning the campsite. In the morning 'Imagine' voyaged across to Deep Hole, others took a side trip on the Ida Bay Railway. Historian Greg Hogg gave a talk on the history of the Southport Regatta (back to 1932). At the campsite frenzied cardboard boat building. 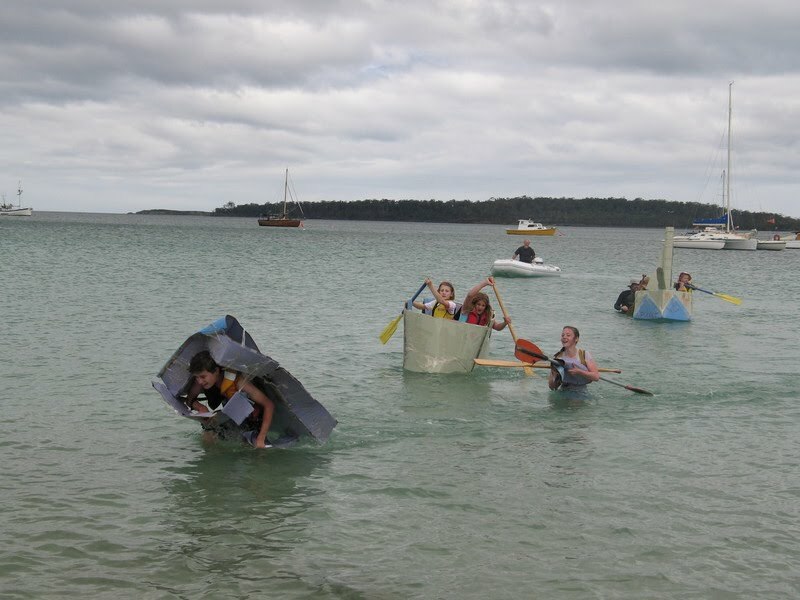 At 2pm 7 cardboard boats were launched, the winner being Crabwacker, defeating Pocket Rocket which disintegrated and several others which completed the race. Many boats took part in the Regatta race, which followed a triangular course around the bay. Sailing boats completed two circuits, rowing boats one. Somebody won - maybe Black Pearl. Of the two rowing craft Julian Robinson in Joy came first, beating Imagine home. Another lovely meal in the evening. the kids were beginning their boat construction of the cardboard quick and dirty. Six fine craft were constructed with rather a lot of cello tape over a couple of hours. the fleet admiral Black Pearl was declared a popular winner. sight cleared quickly after the 6 am rising.